Camp River n Range – Ganges is a refreshing stress busting destination. A silvery sand beach camp, on the banks of majestic River Ganga, 28kms from holy city of Rishikesh, amidst incredibly spectacular landscape, wild Jungle with modern deluxe tents and latest camping amenities. The various panoramic facets of the camp compliment to provide an ambiance of natural environment with modern facilities. A great holiday destination for children, adults, elders, adventurous or not so adventurous people. Everyone who spares a few days at the camp cherishes the memories of the place for long, long time. 3. Camp Jungle Livinn, Chail, Himachal Pradesh. Located in the northern state of Himachal Pradesh, the small hamlet called Chail is a place where time stands still Jungle Livinn is an baeutiful camp located on the Chail Kufri road. 4. Himgiri Nature retreat Sirmour, Himachal Pradesh. Situated in an unpolluted and serene environment, Himgiri Nature Retreat is an eco-resort spread over 15 bighas, located in the heart of Sirmour district, HP. 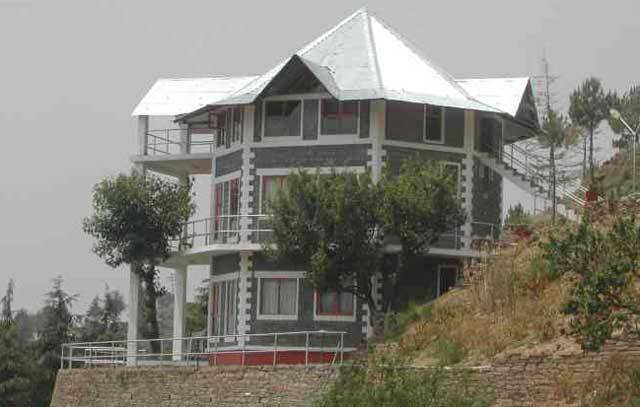 We are a tranquil alternative to Shimla, being at the same altitude (7,000 ft) and located equidistant from Solan (50 km). Far from the madding crowd and 7 Kms before Mall Road is Jharipani Castle Resort on top of the hill easily approachable by road in Jharipani. As soon as you step into the Resort, you will find the perfect blend of nature and heritage, Jharipani Castle is among the oldest buildings in Mussoorie originally owned by Crown Breweries at the time of British and was passed on to the family of Maharaja of Patiala, therefore also known as “Patiala House”. Inclusions:Accommodation for a couple for 02 Nights/ 03 days, Welcome Drink on arrival, Bed Tea, Breakfast and dinner (MAP) on menu plan., Children upto 5 years are free on plan without extra bed sharing parent’s room., 5- 12 years @ 25% & above 12 years @ 35% of the above rates with extra bed. Taxes are extra @ 5%. At an altitude of 6500 ft. our main Camp at Pangot is a short drive from the hill station of Nainital and is separated from the town by a mountainous ridge. Located on a hillside close to a clear running stream, Mountain Quail Lodge & Tented Camp has dense Oak and Rhododendron forest covering the slopes directly behind and to each side; in front there is a range of jungle clad hills through which can be glimpsed the high Himalayas.. Looking west the land falls away to the plains providing a dramatic backdrop for the setting sun. 'Wilderness Plan' includes:- Accommodation, All meals, Morning tea, Jungle walk , Jeep drive for snow views/ bird watching, bon-fire evenings. Inclusions:Acomodation in furnished rooms, all meals, bonfire, evening and morning tea with cookies. Package: 2 nights/ 3Days Packages on MAPAI: Super Luxury Mud Hut Suites: 6999/- Per couple, Luxury Mud Hut Suites: Rs 5999/- Per couple, Eco Cabin: Rs 4555/- Per couple. Inclusions: Accomodation as specified, Break fast and dinner, USe of all facilities at the Himalayan Trout House, Bonfire, Morning Evening Tea Coffee. Inclusions:Welcome drink (non-alcoholic), fruit basket and mineral water in rooms on arrival, All meals. Morning and evening tea. Tariff: Rs 1500 Per person per night on APAI. Special rates for groups on request.